People get abnormally excited over apple cider donuts. I think something in that distinctive smell of a deep fried bubbling ball of dough, cinnamon and sugar drives them into a sense of frenzied enthusiasm and longing: you have hot apple cider? Cannot be fully satisfied without my apple cider donut! I set out to find a lighter version of the calorie and fat laden fall treat we all know and love, and came across this Baked Apple Cider Donuts with Cream Cheese Frosting recipe. Retaining the same shape, texture and spices as the fried version, this recipe incorporates some great additions and healthful substitutes into the dough mixture: apple butter and fat-free yogurt replace the butter, and baking instead of frying eliminates the oil or shortening necessary for the latter. Finally, the donuts are dipped in a reduced-fat cream cheese frosting, and voila: you're left with a perfectly sized donut at a fraction of the calories. If you don't have a a donut making mold, don't worry: you can use a cupcake mold as an alternative. 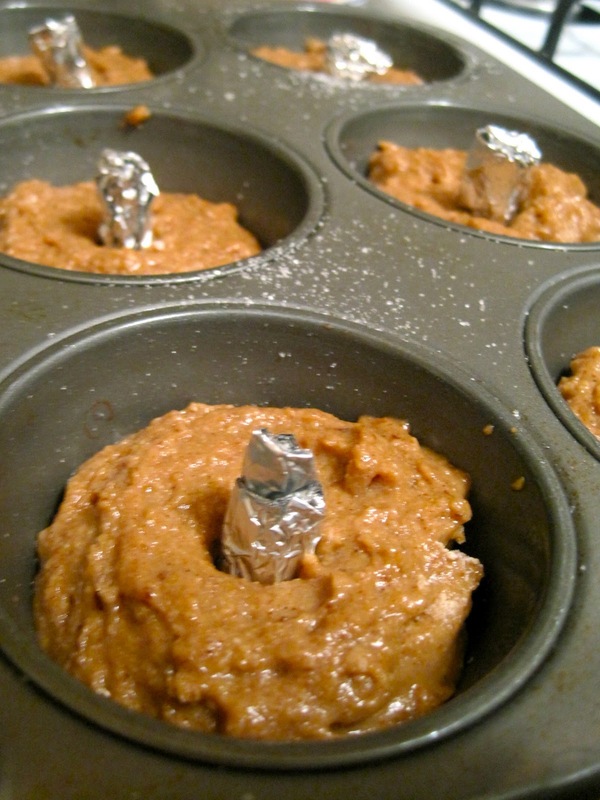 I put little knobs of tinfoil in the middle of each cupcake mold to create my "hole". If you use this method, just make sure the knobs- which should be about the size and shape of a wine cork- are at least half an inch above the batter, as it will rise. Then just twist each knob upwards and pull out after the donuts have cooled. 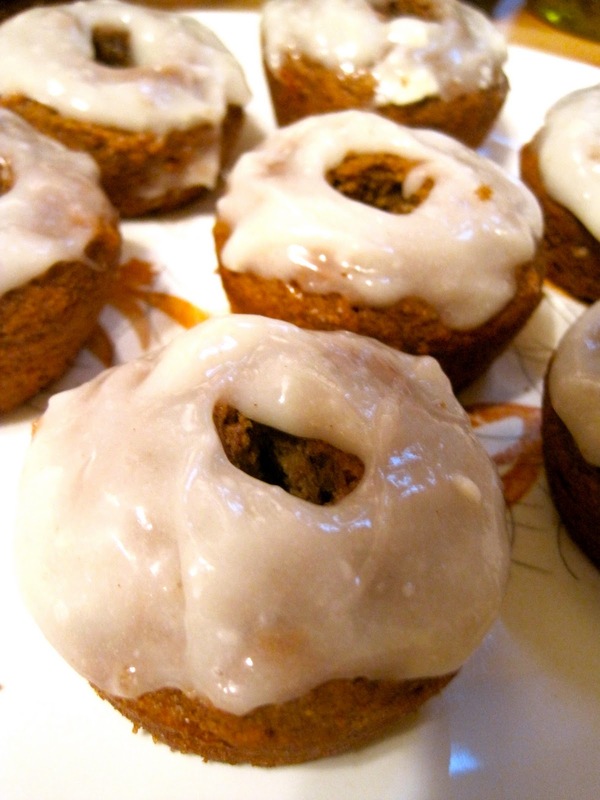 Since you don't have to hold back with these moist airy little treats- according to Recipe Girl, one mini donut (sans frosting) only has about 100 cals- enjoy in abundance with a steaming cup of apple cider. non-fat milk sift other ingredients before adding milk in very limited quantities- I overdid it on the milk and had to make a second batch of icing! 1. Preheat oven to 400°F. Coat pan with nonstick spray or oil. Sprinkle with sugar, shaking out excess. 2. In a mixing bowl, whisk together flour, baking powder, baking soda, salt and cinnamon; set aside. In another bowl, whisk together egg, brown sugar, apple butter, maple syrup, cider, yogurt and oil. Add dry ingredients and stir just until moistened. Divide half of the batter among the cavities in the prepared pan, spoon about 2 generous Tbsp. of batter into each cavity. Don’t fill them to the top or your doughnuts will lose their holes when the batter puffs up while baking! 3. Bake 10 to 12 minutes, or until the tops spring back when touched lightly. Loosen edges and turn the doughnuts out onto a rack to cool. Clean the pan, re-coat it with oil and sugar. Repeat with remaining batter. 4. Ice your doughnuts, if desired. Sift 1 cup powdered sugar and mix w/ 2 ounces light cream cheese, a dash of cinnamon and enough nonfat milk to create a spreading or dipping consistency. Dip tops of doughnuts into the icing, then set right side up on a rack to let the icing set. These look AWESOME! 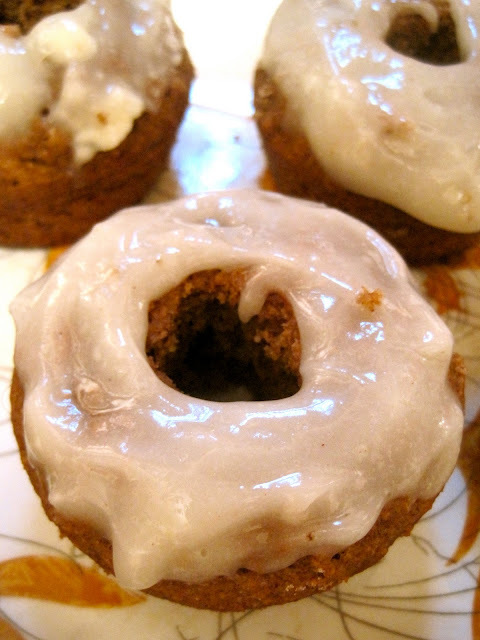 I have been meaning to try baked apple cider donuts forever and this healthier recipe is just what I'm looking for. I also love how you used foil knobs with a cupcake tin instead of a donut pan. Definitely have to try these soon! These look so rustic and delicious. Love that you squeezed in some whole wheat flour! To be honest I would not miss all that grease-just the aroma of these baking I am sure is enough to entice. Well done! wow this is amazing!!! so delicious! I love how you replaced everything with healthier ingredients but it doesn't lose any of the taste!